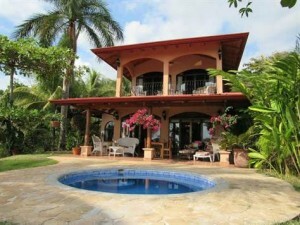 This home for sale in Costa Rica is another fine example of luxury in the jungle! This 2 bedroom, 2 bathroom home is located on just under 1 acre of land and has excellent access. It is only 3 min up a mountain road from the cute town of Hatillo and a few more minutes to some of the nicest beaches you will ever see. The mountain road is paved so no bumpy dirt roads to get to this one! The property has amazing white water ocean views all the way up the coast to Manuel Antonio and all year sunsets!! Downstairs there is a kitchen and living room that are joined to make an excellent use of space. This opens up to a nice covered patio and the pool. There is also a bedroom and full bathroom on this floor. The second floor consists of a large master bedroom with full ensuite bathroom and a large covered patio which has the best view in the house. There is also a 2 car covered carport which has a storage area and laundry area and the property has a gated entrance. This property also has it’s own deep water well with concession that is only for this house. The owners are selling the home fully furnished including the TV and the artwork so someone can move right in or start renting it out right away. The house is very clean and well maintained and has a unique charm to it. If you are looking for a home with an amazing ocean view and great access that is turn key than this might be the home for you!!! !